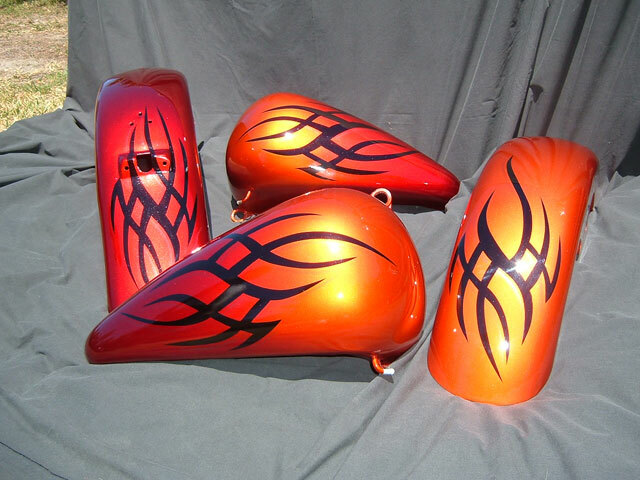 When Custom Paint jobs look their best, is when people understand more about what makes them custom paint, and what makes a custom paint job look amateur. A good thing to remember is using warm tones with cool tones can often turn out bad. 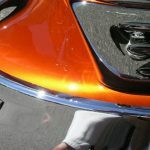 A few years ago, one of the car companies made a light blue car, and put an orange “ghost pearl”, on top of it. This made a hideous color that no one liked. When you look at warm tones, it makes sense to use them over other warm tones. Take this 55 Chevy fender, for example. It was painted dark orange, and had a nice Gold Ghost Pearl over it. Illusion Pearls differ from Candy Pigments, as the actual particles of Illusion Pearls are transparent, and only reflect color in the sun. Remember that our Illusion Pearls can be sprayed on any color to create a custom paint effect. Even if you own a black car, and you want to give it an extra color where the sun hits it or under the street lights as you drive around at night, you can add a bit of ghost pearl to some clear and liven the whole thing up. Granted you will still have a black car in the shade, but it really pops when ghost pearl gets under the lights.